Kameela Nasser is an eloquent woman. A contestant from Makkal Needhi Maiam (MNM), Kameela’s confidence and firm grip over grassroots level issues are rare in a newcomer to politics. 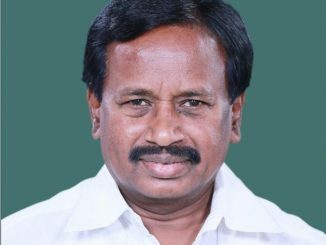 Contesting from Chennai Central Parliamentary constituency, Kameela is fighting it out against big names: PMK (alliance with AIADMK)’s Sam Paul and DMK’s Dayanidhi Maran. A film producer, and wife of character artist Nasser, Kameela has been part of Kamal Hassan’s MNM for over eight months now. 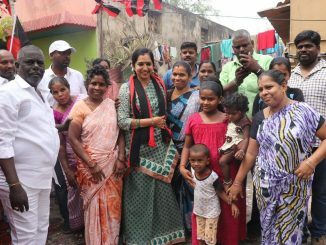 In a detailed interview with Citizen Matters Chennai, Kameela talks about her life before politics, the campaign trial and the pressing concerns in the constituency of Chennai Central. What is the core agenda of MNM? Citizens’ upliftment and welfare is our focus. We believe that policies that are not people centric should be shunned. It is vital for a political party to become a movement. The best example to cite is Jallikattu, where the will of citizens helped bring in an amendment of the law. MNM has chosen that path to become a political movement. We are trying to create awareness amongst the people about being responsible citizens. Secondly, it is seldom about winning or losing, as the party will continue its work. Before you got the ticket to contest from Chennai Central, what were your responsibilities in the party? I have been the zonal head of MNM’s Chennai region for the past eight months. My role was to research on civic issues and understand the strengths and weaknesses of the party. I am aware of the critical concerns of Chennai. MNM’s poll promises include creation of 50 lakh jobs and free housing for the poor. How feasible would the implementation be? Our promises are interlinked. The success of one project will help another. The free housing scheme (Gudisa Illadha Tamizhagam) will provide employment for civil engineers. Conservation of water bodies will open up recreational options that in turn will create employment opportunities. We are also expanding Satta Panchayat Iyakkam’s idea of organising Gram Sabhas. MNM President Kamal Haasan envisioned these promises after a series of discussions with experts and organisations. You are the wife of an actor. Your political opponents say you will not understand the woes of people. How do you propose to counter that? I have an MPhil in child development and family relations, and I did research on child labour for my thesis. I have been interacting with people as part of my work, and understand their plight. I had a child counselling centre, a first of its kind, back in the city in the 1990s. I was a face for many organisations such as Banyan and Seva till a few years ago. My volunteering work as a counsellor in a Corporation school at Arumbakkam is well known, as my efforts paid off in reducing the dropout percentage among girl children. My experiences help me empathize with the people of Chennai. Was your political entry pre-planned? No. I am a frustrated Indian citizen who wants to reform the way things are. I am happy that there is a party that supports my ambition. It is an achievement indeed that a 13-month-old party (MNM) is contesting parliamentary elections. Why did you choose Chennai Central constituency to contest in the 17th Lok Sabha elections? I did not choose it. I got through the interview held by the MNM’s selection committee. Our interviews were strict (chuckles). 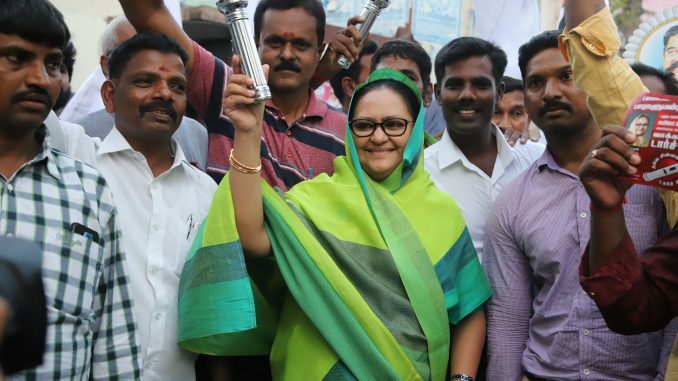 Talking about the interview, the party was embroiled in controversy for having a new face (in politics) such as Kovai Sarala in the selection committee. 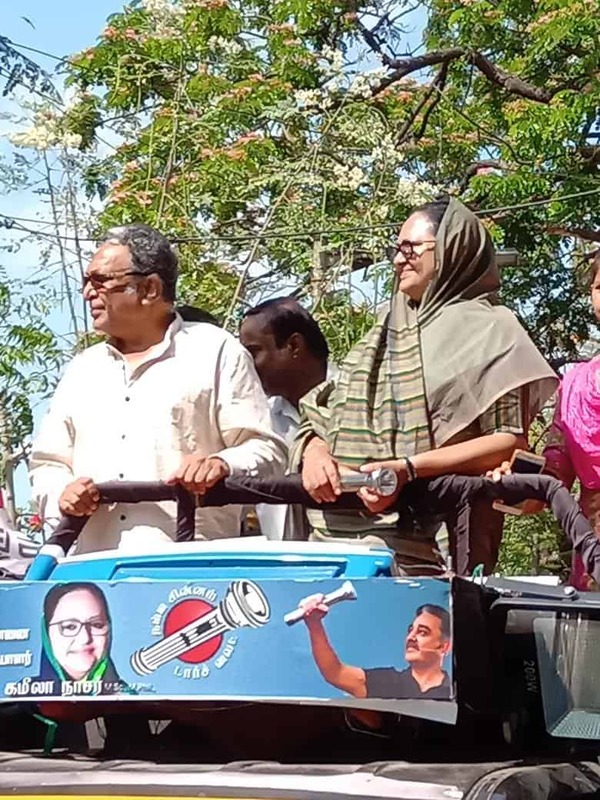 Kovai Sarala’s presence in the panel is justified because every citizen has the right to assess and select a candidate, just like they have the right to vote. She is a talented person, who knows the vibes of the people. So why not her? What are the critical issues facing Chennai Central constituency? None of the elected representatives (for Lok Sabha) have done productive work in Chennai Central. Acute water scarcity, sewage water contamination (in localities such as Thideer Nagar), overflowing garbage bins, lack of government hospitals in Villivakkam and plight of manual scavengers in Swathanthira Nagar are a few burning issues. Many promises by the ruling government, such as bringing multilevel parking in the constituency, were not fulfilled. How has your experience on the campaign trail been? The campaign trail has been a learning experience for me. When I open the tap at my home, the scene of women carrying empty pots to fetch water flashes before my eyes. I have been persuading my children to conserve more water than ever. 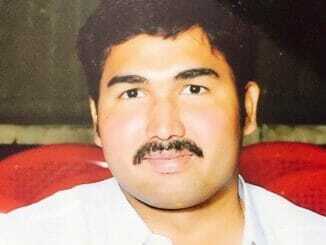 What do you think about the performance of the current MP, S R Vijaya Kumar? As a parliamentarian, he has spoken in the house (Lok Sabha). But he never visited his constituency and has no vision for the people. Many don’t even know that he is the MP. Chennai Central constituency had a voter turnout of 61.39% (in 2014 LS elections). How do you intend to increase the percentage? Wherever I see a crowd, I talk. Some people smile, some wave and give a thumbs up. My aim is to change their mindset, get them to question the elected representatives. I also talk about the importance of exercising one’s franchise in a democratic nation. I will consider my efforts successful, even if I can make a tiny change. What are the three things you will focus on, if you are elected? Women empowerment: That includes a focus on education and employment. It may be noted that our poll manifesto includes 50 per cent reservation for women. Children rights: I will use the knowledge from my past and try to research various factors contributing to the school dropout rates, before I sketch out a plan. I will sensitise the public on citizen rights. Cooum River is an integral part of many lives in Chennai Central. What is your view on Cooum River restoration? Cooum is a long project that requires the attention of elected representatives and citizens. We (MNM) took three months to procedurally clean the outlet of Cooum near Mylapore. The major political parties wanted to own the result as suddenly they were interested in painting the walls. Why didn’t Kamal Haasan contest the elections? Had he contested, we would not have been tense. But again, he would have focused on just his constituency. I think it’s better he didn’t contest this time. He is a Chief Ministerial candidate, who should focus on Tamil Nadu. Incumbent J Jayavardhan is seeking reelection in the upcoming Lok Sabha polls; before you make a decision on whom to vote for, check out how he fared in his last term, in terms of attendance, debates MPLAD fund utilisation etc. P Venugopal of the AIADMK seeks a third term from Thiruvallur in this election; take a look at his performance in Parliament and what he has done for his constituency over the last five years. Madam, what is your stand on triple talaq and common civil code.